North Carolina’s redistricting plans have drawn major court involvement over the last few years, and it’s not looking promising that trend will change in 2018. There are five pending redistricting cases, four of which have had some action in the past month and it’s not easy to keep them straight. 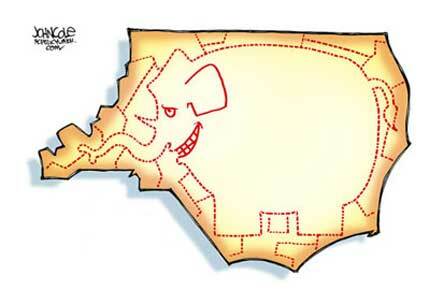 They involve legislative and congressional maps, partisan and racial gerrymandering and state and federal courts. The state is so deep in litigation over its maps that it’s not even clear what the elections later this year will look like for certain voting districts. Policy Watch has put together a helpful guide on where things currently stand and in which court. Four of the five pending cases are at the nation’s highest court and involve two types of gerrymandering claims. North Carolina v. Covington: This case involves state legislative districts – 28 of which were found to be unconstitutionally racially gerrymandered. After a U.S. Supreme Court ruling affirming that finding, the legislature redrew the maps. Litigation continued with the plaintiffs objecting to 12 of the newly drawn districts. A federal three-judge panel appointed a special master to weigh in and redraw the districts in question – two Senate districts and seven House districts. The panel approved the special master’s plan on Jan. 19 and the legislative defendants filed an emergency motion with the Supreme Court to stay their decision. They also filed a notice of appeal to the high court. Justices have not yet made a decision on the motion to stay the special master’s plan and responses from all parties in the case are due by noon Friday. Rucho v. Common Cause and Rucho v. League of Women Voters of North Carolina: These cases involve two separate legal challenges to the state’s 2016 remedial congressional map. They were combined into one trial in October. On Jan. 9, a federal three-judge panel agreed with the plaintiffs in the cases that the remedial congressional map was unconstitutionally gerrymandered for partisan gain and blocked the state from using it in future elections. The panel ordered the state to redraw the map and noted a plan to appoint a special master to draw an alternate plan in an effort to cater to fast-approaching election deadlines just in case lawmakers’ redraw was unsatisfactory. Legislative defendants filed an emergency motion with the Supreme Court to stay the lower court’s order, which was granted. They also filed an appeal. The plaintiffs later filed a motion to expedite the case, but the high court has yet to rule on it. Harris v. Cooper: This case was formerly known as Harris v. McCrory and involves a Supreme Court appeal of a lower court’s decision not to hear a partisan gerrymandering claim about a remedial 2016 congressional map. Justices have not yet responded whether they would take the case. There is one case pending in a state trial court. Dickson v. Rucho: This case involves challenges to the 2011 state legislative and congressional maps. It’s one of the oldest redistricting cases and has been sent back to the North Carolina Supreme Court three times from the U.S. Supreme Court. The most recent decision from the state’s highest court was to send the case back to a three-judge superior court panel to decide whether the issues were moot in light of another U.S. Supreme Court decision or whether relief was needed. The panel heard the case Dec. 15 and has not yet made a decision. With the exception of Covington, each of these cases could still have a long road of litigation ahead. Lawmakers have also taken on judicial redistricting in the midst of this unresolved litigation, so it’s very possible there are more lawsuits to come.